Chantal Marie Living comes to us this week from Chantal in Florida. Chantal was born in the French West Indies, raised in Quebec, Canada, currently lives in Florida and enjoys traveling the world finding inspiration for her shop. Chantal Marie Living is a very fitting name for her shop as it brings together her family tradition of crafting and mixes in eclectic prints and vivid colors that she finds in exotic places. Offering bottle gift bags, quilted seat belt covers, crossbody mini bags, mirrors, pillows and more, Chantal Marie Living's items may just send you daydreaming into a far off land as well. 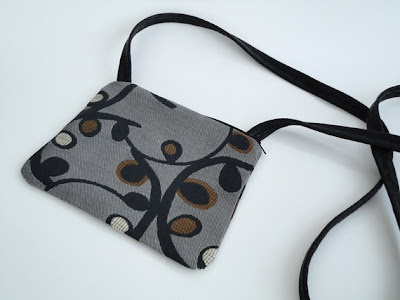 Large enough for a wallet, cell phone and keys, plus in a great design that is fun yet neutral enough to be completely wearable, makes this bag is perfect for outings. It is 8” (20.5cm) wide by 6” (15cm) high. 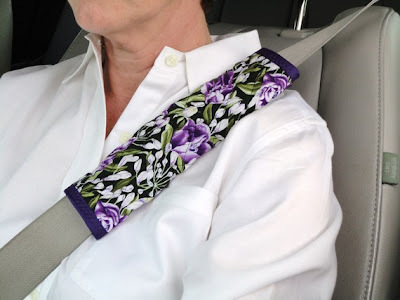 Sewn from cotton fabric in a beautiful tulip design and batting used for comfort, this seat belt cover will protect your next when riding in your vehicle. 1. Check out Chantal Marie Living on Etsy. Come back here and tell us about your favorite item or items in the shop. 2. Be or become a follower of Joy De Vivre for a second entry. Entries will be accepted from now until next Sunday, the 24Th, at noon. Check back that afternoon to see if you are the lucky winner! Good luck! I like the very oriental Dancing Dragons wine gift bag, such elegance! I follow via gfc, thanks for the lovely giveaway. 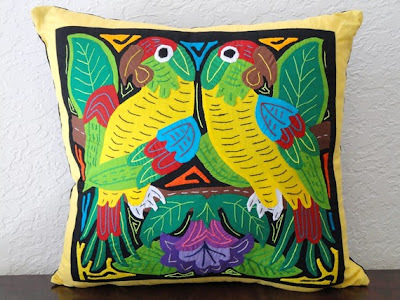 I love those Parrots and the Yellow Hibiscus Molas! 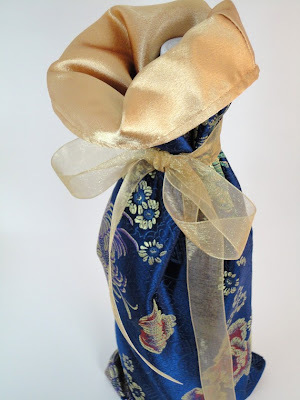 If I won, I would greatly enjoy the Wine Bottle Gift Bag in Teal Satin. :) You've found a nice site - especially for those living through another dreary, overcast chilly wintry/early spring day. Thanks for the nice comments Heather. The pictures came out great. You have a very nice blog.